Silver on the outside, peacock blue enamel on the inside. Is that awesome or what?! I don't know whether or not I want to polish the outside or keep it crazy tarnished like it is now. Hmmm.. I got it off of Etsy (of course). I did some googling and found this ad.. I guess the bowl is from 1958! My mom has a very similar bowl from the same era that I totally covet. ;) Great find! Leave it tarnished! It's so pretty! Leave it! I was going to do a post about my tarnished Revere bowl because it's tarnished black like that on the outside and has a warm, coppery look (not unlike your gorgeous pendants) on the inside. I just love how it looks and have decided not to polish that baby. Oh, and I don't think it's lame at all to post about a bowl! That's so cool! I hope you keep it tarnished. The dark color is so striking with the blue. I just bought that exact bowl at an estate sale last Friday! I also love mine, but it is shiny and polished. I don't know if you've ever covered this before but do you have any Etsy pointers. I love the idea of Etsy & I would love to use it more but I get so overwhelmed by everything listed that I never end up buying anything. Do you have certain stores you check out or just search for particular items? What's your secret? I just scored one at an estate sale last Friday! Mine's perfectly polished and I love it, although I must say I'm drawn to the character yours has. Either way it will be beautiful! 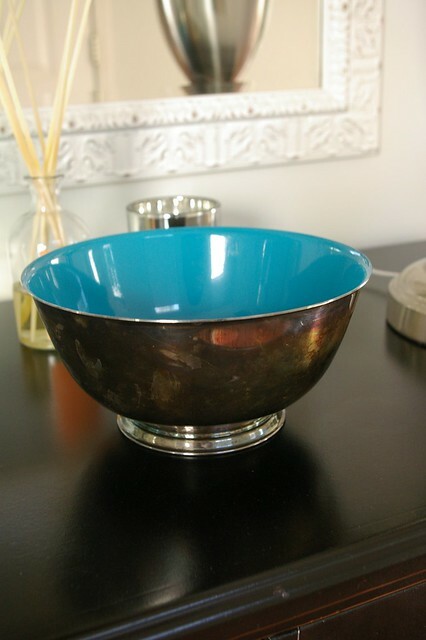 I love a Revere bowl anyway, but I super duper extra love the enamel! Polish that baby. I'm really enjoying your blog--love seeing real life work on your house rather than the usual pastiche of magazine pictures cribbed onto a decorating blog. Keep it up! I've never seen anything like it. Great find! Leave it tarnished! I love the contrast. What a nice find. I think you should polish it. And then let it go, if you decide you prefer the tarnished look (or if you're just lazy like me), since it will darken again if you don't keep at it. Great find! I say polish it, it really makes the color pop. And it will tarnish back eventually. So cute, but silver unlike many other metal colors looks so much better polished and it usually does not diminish the value. I love your blog!!! This isn't lame, girl! I love it. Bryn-getting ready to list one on Etsy with kelly green on the inside! Keep the tarnished look!! I love the contrast the brown has with the blue rather than that silver in the ads! Love old stuff too. And the tarnish. Today, anyway. Enjoy the awesome weather this weekend! Beautiful! I love how it looks next to your lamp. How stunning, Bryn! 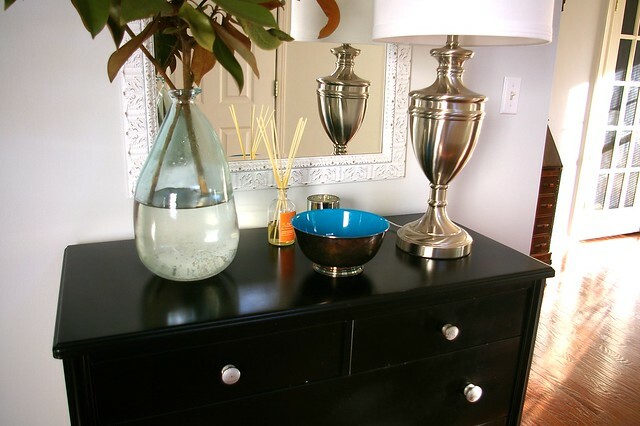 I adore the pop of color and the light tarnish, it feels so perfectly modern and antique-y at the same time!! !